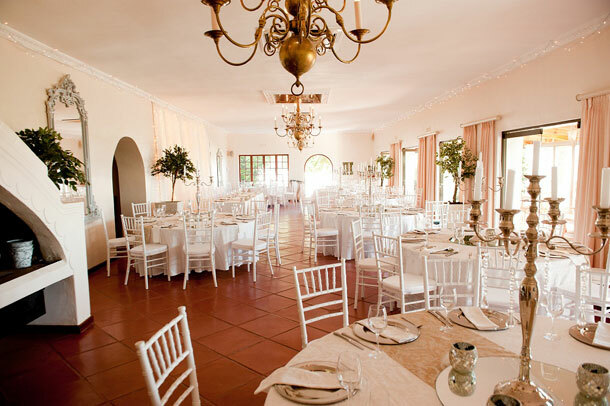 Offering a beautiful, picturesque setting with magnificent views and exquisite decor in the Cape Winelands, the Guinea Fowl Venue at Saxenburg Winery offers excellent food prepared by experienced and dedicated chefs and professional, attentive service from in-house wedding coordinators and team. Rolling lawns and manicured gardens complete with a huge ancient oak tree set in front of the iconic 1701 Cape Dutch manor house making this the ideal location for wedding ceremonies in Stellenbosch. Stunning views right across the False Bay valley to Table Mountain provide an idyllic backdrop to this enchanting setting. Inside, a large fully air conditioned function room hosts from 40 up to 100 guests with dancing. This historic building also enjoys breathtaking views right across to Table Mountain and beyond to the Atlantic and Indian oceans through the front wall which is impressively constructed almost entirely of glass. Luxurious drapings, over 1000 fairy lights and statement piece antique brass chandeliers complete this magical venue, and the large feature fireplace creates a warm atmosphere on chillier days. The function room is ideal for wedding receptions, birthday celebrations and corporate events. Pre-drinks can be served in the pretty garden directly in front or from the thatch lapa adjacent to the world class tasting room. This grand estate offers abundant photo opportunities including a secret rose garden amidst the vineyards and a game viewing deck overlooking camps of springbok, zebra and blue wildebeest. The Guinea Fowl Restaurant closes to the public at 4.30pm each day and thereafter the entire venue, including the bar, inside area and gardens, is exclusively for the use of you and your guests. Breakfast / early afternoon weddings are also available. 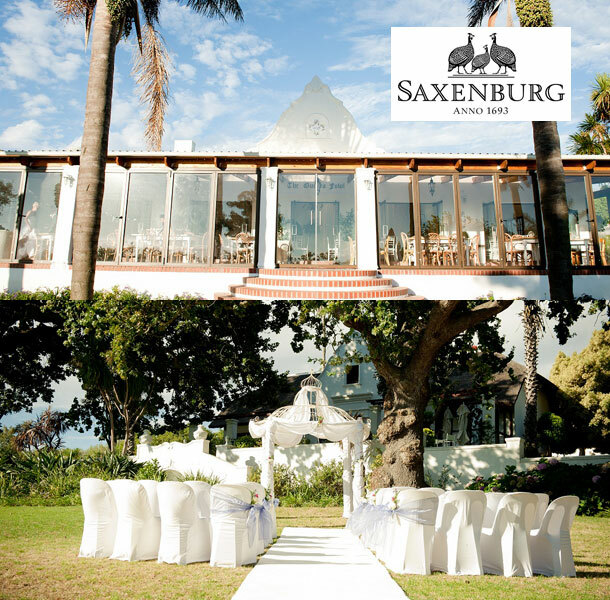 To book your wedding at this gorgeous venue telephone the team on +27 (0)21 903-6113. Alternatively visit Saxenburg Winery for further details or to send an enquiry.